The spectacular foliage is gone, and although we’ve had a few dustings of snow, the ground won’t get its bright white winter blanket for another month or more. This quiet spell between the departure of leaf-peeping tourists and the arrival of the skiers and snowboarders is what Vermonters call the gray season. The chain saws that roared throughout the summer are silent now, and it’s time to finish gathering kindling and stacking the seasoned firewood on the porch. There’s pruning and bulb-planting and garden clean-up and mulching to be done, too, and not much daylight for accomplishing all of this. The gray season has its own subtle beauty, though. The trees, having shed their leaves, reveal their forms. Dormant bird nests and hornet hives are uncovered, too. 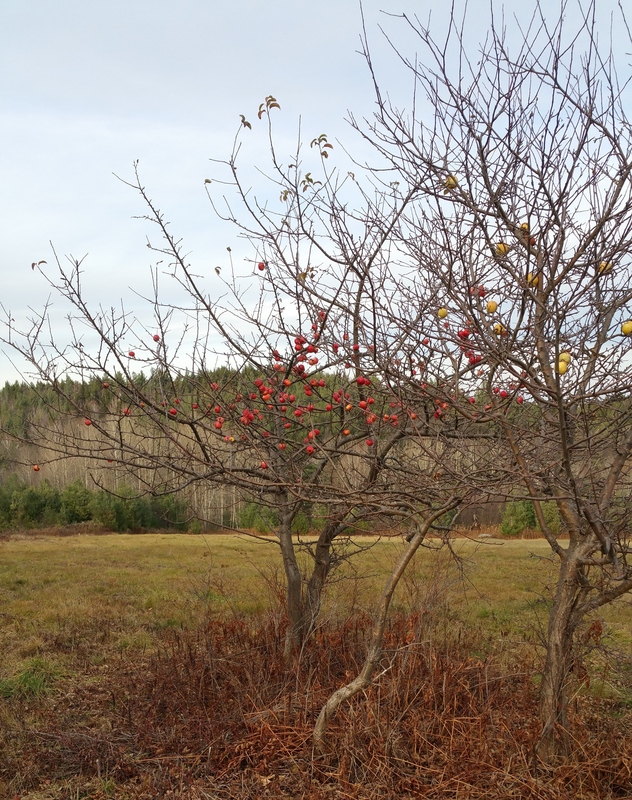 Apples depend from bare trees like glowing ornaments, red, yellow, golden brown. On hillsides, the dark green pines and spruces stand in stark contrast against the background of silvery hardwood barks. You can see far into the woods, and the canopy that once hid the sky from view is now a delicate scrim through which blue skies and cloud formations and blazing sunsets are visible. It may not be the stuff of tourist brochures, but it provides a lovely coda for the year, with the faintest note of melancholy. BEAUTIFUL!! So simple. Such spare language. Sitting here in the Village, I’m transported to Vermont. You make it look so easy to write this!